Super cute. I'm always trying to make myself love blazers and I just don't but I did like this one a lot. I forget what size it was but it felt TTS. The skinny stripe material is really cute and summery. Big thumbs up if you are a blazer lady. LOVE this Three Dots version - stripes and casual material - yum! This pink Tommy Hilfiger version is so summery and loving this Rachel Roy version that is much more structured and dressy. I'm always wishing I had some sort of cute long-sleeve button down to pair with shorts and skirt in the summer. The body of this shirt is fine but I am not digging on those crazy sleeves. 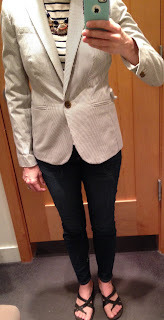 J Crew insists on repeating this silhouette and I don't get it. It just makes me feel like Judy Jetson. This silk version might be perfect for tucking into skirts and shorts or perhaps the factory version? This GAP version also looks pretty cute but I'm a little worried about those sleeves. J. Crew does tons of these little tops every season. They are great to throw on under a sweater or blazer and definitely feel a bit dressier than your average tee. I like the color of the palm print - really beautifu shade of blue. My norma size (for this type of top) felt good to maybe slightly snug on my bust. It's a bit on the longer side so I might think about the Petite but the armholes were great. If you're looking for an off-the-shoulder version of Palm Print, how adorable is this shirt? This one is in black and white, but the price is more affordable. This one also looks swingy and cute. Haven't had much of a chance to check out new arrivals but hoping to have some free time to do so soon. What have you liked?